“Hungarian Tea Party” or “Occupy Brussels”? 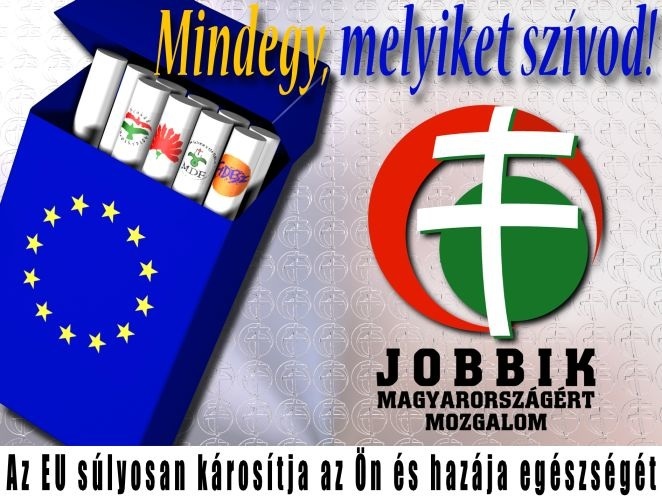 In a “letter to Hungarian farmers,” a candidate for the European Parliament launched her 2009 campaign—in a country reeling from the first and hardest blows of what would become a Europe-wide crisis—with a list of demands: for local ownership of land, preferences for local production, and “human-scale farms that sustain Hungarian families and preserve villages.” However, this was no Green or Socialist candidate, but one from an extreme right-wing party, called Jobbik Magyarországért Mozgalom, or “The Right Ones’ Movement for Hungary.” Despite never having held office of any kind before, she won her seat, and is now the sixth-most popular politician in the country. While massive street demonstrations in Greece and Spain have shown the high level of popular resistance to austerity programs imposed as the ‘only viable solution’ by the European Central Bank and political leaders, no major West European party has reflected this opposition. In contrast, the current Hungarian right-wing government and the more extreme Jobbik, echoed by parties in Slovakia and Poland, have largely opposed the oppressive neoliberal demands of the EU. The idea of ‘right-wing’ political forces pushing ‘left-wing’ measures is something difficult to understand in the US and even West European political contexts, but makes sense in light of this region’s different history. 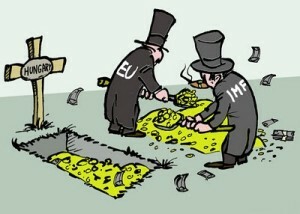 In essence, Tea Party-type movements have come to oppose rather than endorse the program of the European economic elite. Eastern Europeans ended forty years of Communist rule in 1989. Citizens, tired of material shortages and the lack of political choice and national independence, thrilled at the ‘return to Europe.’ They expected the ‘normal’ life, prosperity and democracy, which they envied in their West European counterparts. However, the realities of system change, power and wealth inequalities, domestically and in Europe as a whole, and the role available to the region in the post-Cold War ‘new world order’ quickly led to disappointment and discontent. Privatization of state-owned enterprises and public resources concentrated wealth in the hands of a politically connected few, many of them former Communist officials. Application of strict capitalist criteria resulted in massive layoffs and plant closings, while social benefits such as childcare, subsidized public transport and vacations, and guaranteed employment and health care were scaled back or eliminated. By the time Hungary and seven other former socialist countries were admitted to the European Union in 2004, most East Europeans had become skeptical or downright cynical about the benefits that European integration could offer them. The new members faced significantly lower standards of living than in any of the existing members, generally higher unemployment, deteriorating services, public insecurity, and political and ethnic conflicts at home and across borders. To rub in their clearly inferior status, the promised free movement of people across the Union was delayed for up to seven years, while the immediate free movement of capital allowed German, French and other companies to take over local ones and, often, shut down domestic production in order to take over market share. Political frustration, and even nostalgia for the Communist past—when citizens felt oppressed but at least everyone had a job, a place to live, safe streets, and reliable and free social services—became rampant. Despite this nostalgia, the complete discrediting of socialism as a political alternative—by Right and Left parties alike—left no easy path for resistance to the neoliberal EU program. In Hungary and several other countries, it was nominally left-liberal governments—led by ‘Socialist’ parties formed from the remnants of the Communist ones—which actually pushed through the harsh restructuring and austerity programs of the 1990s, causing shutdowns of factories and hospitals, withdrawal of subsidies for basic necessities, and general economic pain. Thus the way was open for nationalist parties to, while preserving their rhetorical anti-communism, take on a critical stance towards the imposed demands of EU accession and international markets. In Hungary, this role has been filled by the Alliance of Young Democrats-Hungarian Citizens’ Party (AYD-HCP), in power since May 2010. AYD-HCP formed in 1989 as a liberal youth party, but beginning in the mid-1990s moved steadily to the right, to the point where it now promotes a “Christian Hungary,” condones racism and even violence against the Roma (Gypsy) underclass, and vilifies political opponents (liberals) as communists and traitors to the nation. Though AYD-HCP gained barely more than 50% of the votes in the last election, electoral rules turned that into a two-thirds majority in Parliament. This dominance has allowed the new government to take full control of all aspects of the state and push through a new Constitution, which has been criticized by the opposition, the EU and independent media as anti-democratic and practically guaranteeing a hold on power for decades. At the same time, Prime Minister Viktor Orbán has blocked further cuts to social programs and public employment (after those begun under the previous left-liberal government, and stepped up in response to the 2008 economic crisis), instituted a bank tax, and in general promoted Hungary’s interests against those of bankers and EU policy. Although he and his party’s motivations are more nuanced than just ‘defending the people against the power’—AYD-HCP is itself allied with certain big economic interests—their rhetorical and to some extent actual stance has proven to pay dramatic political benefits. In addition, the aforementioned Jobbik surged into Parliament as the third-largest party, barely behind the Socialists who formed the previous government (and are the only notable opposition to the right-wing dominance). 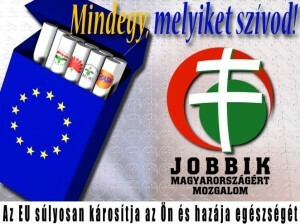 The Jobbik are known for their demands for the ‘lost’ Hungarian territory, allocated to neighboring countries in the post-World War I settlement; overt racism and violence against Roma, gays and foreigners; and an associated paramilitary arm that carries out street demonstrations in uniform and employing insignia and a salute reminiscent of the Arrow Cross, the Hungarian fascist movement of the 1930s and ‘40s. Yet they are the only parliamentary party calling outright for withdrawal from the European Union, are harshly critical of the international financial system, and strongly defend (at least rhetorically) the living standards of ordinary Hungarians. European fascism in the interwar period was famously a mix of authoritarian, repressive politics and the promotion of the welfare of the nation and the ordinary citizen (thus National Socialism). The current Hungarian government, with its attacks on the independent media, political opposition and minorities, feels more and more like a Mussolini-type fascist regime. Its heavy-handed tactics have already alienated many Hungarians from all classes; but the significant support it does retain stems in large part from the fact that, in contrast to the previous government’s unfailing appeals to orthodox Western liberal ideas of the unfettered free market, it does seem willing to stand up to the European and global order and defend ordinary Hungarians in this time of austerity and the dismantling of the welfare state, as demanded of Greece, Italy and other EU ‘crisis cases’. The political situation in Hungary, and other former socialist Eastern European countries, offers no easy choices for an American leftist. But it is a window on contradictory and uncomfortable trends—the convergence of social conservatism with economic nationalism, of intolerance at home with resistance to the neoliberal order—that are also present in our own convoluted political landscape, and are intensifying across the globe as the crisis deepens.